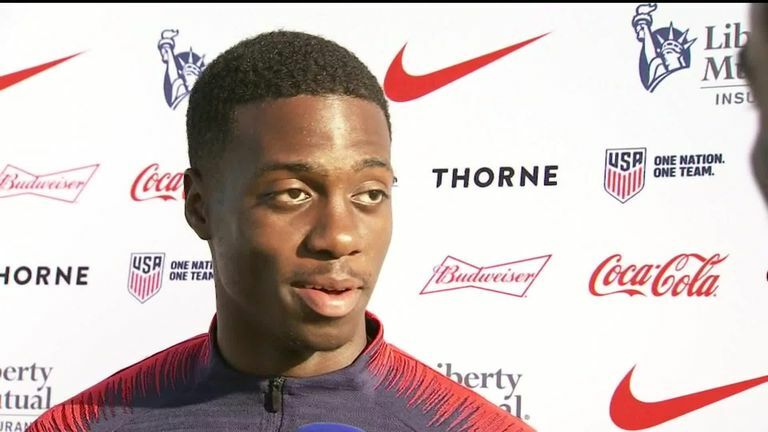 Timothy Weah says playing against England at Wembley in Wayne Rooney's last international will be a "dream come true". The forward is part of the USA squad that is preparing to face England on Thursday - live on Sky Sports - it what will be Rooney's farewell to the national team. The 18-year-old - who plays for PSG and is the son of former Ballon d'Or winner and current president of Liberia George Weah - is also looking forward to testing himself against some of England's young players. He told Sky Sports News: "Man, it's a dream come true, knowing Wayne Rooney's going to be playing his last game and it will be my first time playing England. "England have such an amazing team, with the likes of (Raheem) Sterling, (Marcus) Rashford and all those guys. These are the guys I've been watching throughout the years, and to play against them at Wembley is crazy. I'm really happy and really excited. "It's going to be a great experience, because these are the guys I'm going to be playing against for years to come, whether that's in leagues or Champions Leagues. So it's going to be interesting to see what they are like when you're not watching them on TV. "I'm going to take everything from it, learn from it and just try to develop my game." Weah left the US for PSG when he was just 14, but is still full of praise for the impact Rooney has had on MLS since joining DC United in the summer. The former Manchester United and Everton forward helped to take the side from the lower reaches of their conference to the end-of-season playoffs in a matter of months, and Weah cannot wait to meet him. "Rooney's a legend. He's one of my favourite attackers of all time," he said. "He's a guy I really do look up to. "I'm so happy to be playing against him for his last game and I'm definitely going to shake his hand and just tell him 'thank you for what you've done for football'. "If you look at where DC were when he came to MLS, he changed the team completely by himself. It's amazing to see what one guy can really do to a team."